Conservation arboriculture sees trees as more than just landscape fixtures, but as whole ecosystems, and argues for the intrinsic value of the macro and microscopic organisms living within mature and veteran trees. Last week a buddy of mine forwarded me a whitesheet by Neville Fay on retrenchment pruning. This form of management is a concept practiced in conservation arboriculture. 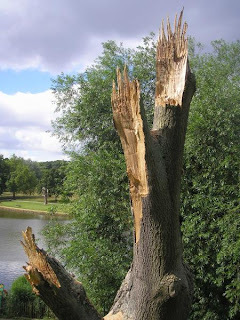 When trees are damaged in nature it`s usually due to some catastrophic event (i.e. severe wind storm). Branches damaged in this way have wood fibers break and tear, while bark is pulled away from limbs and jagged stubs are left behind. In the aftermath all manner of fungi and arthropods make a home in the tattered remains. Fungi feed on the newly exposed wood, insects eat the fungi, birds eat the insects, and so on. In landscapes, trees eventually mature to where their risk of failure reaches a threshold that some mitigating action must take place. For conservation arborists, this is where retrenchment pruning comes in. By using coronet cuts to mimic naturally damaged limbs after reduction pruning, conservation arborists invite the natural order of things to take place. 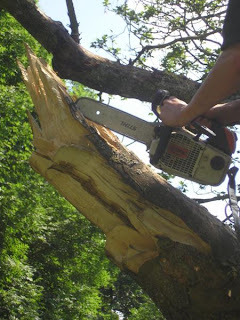 Another technique, natural fracture pruning, is simply tying rope to branches and applying force until the branch breaks. This seems to be most popular in the UK, but I've seen coronet cuts used at The Capilano Suspension Bridge in North Vancouver, British Columbia. Obviously this isn't for everyone, or every tree. In fact, retrenchment pruning seems to go against all traditional pruning techniques and goals. This concept isn't meant for the feature tree in the average front yard. But, this may be appropriate for that mature tree in the wood-line at the back of a property which poses a hazard to the swing set. This idea may also work for any veteran tree that has fallen into the spiral of decline. In the Capilano Suspension Bridge example, entrenchment pruning was used on declining trees along forested walkways before they became hazards. Another thing to keep in mind, retrenchment pruning in its idealistic form can take decades of management. Vigorous sprout growth can result from damaged limbs, and so with this form of tree management. Talk about commitment from both arborists and tree owners. The long-term goals of all invested parties need to be discussed before this type of work is performed.